Mr. Varemenos, visited the Greek Centre together with the Consul General of Greece in Australia, Mr. Dimitris Mihalopoulos and the Education Coordinator, Dr. Georgia Nikolaidou, and met with the GCM Vice-President Mr Theodoros Markos, the Secretary General Mr. Costas Markos, the Board member Dr. Nikos Dallas, and the principal of the Community Language and Culture School Mr Mano Tzibragos. After a brief tour to the Greek Centre's classrooms, Mr Varemenos had an open discussion about the education issues that concern the community. 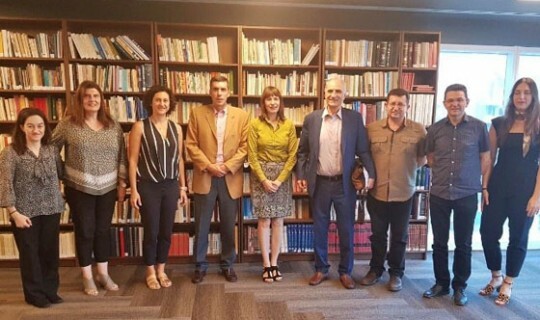 The meeting was also attended by Dr. Stavroula Nikoloudis, Chair of the Greek Program at LaTrobe University, Ms Maria Bakalidou and Ms. Katholiki Yordamni.